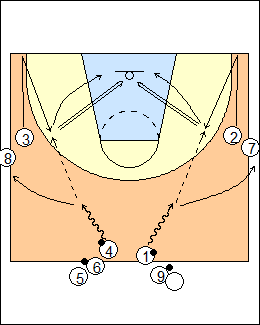 Four balls, 2 and 3 bump the baseline to get open, hands up (greedy receivers), 1 and 4 crab dribble with their outside hand from the jump circle to the swing positions (slots), make one-hand air or bounce passes off the dribble, 2 and 3 catch, inside-foot front pivot (get low, get squared, get balanced), take two-point shots to start, rebound and go up the middle to the opposite passing line, 1 and 4 follow their passes to the shooting lines. - square up, shot fake, sweep baseline, pull-up. Go for 3-5 minutes, how many makes. Variation - V-cut, L-cut or step and seal to get open. See Shooting - Bobcat, Pitino V-cut, Ten fingers, 5star cutting, Continuous, Layups - Blast cuts. - pivot hop, very popular in the NBA (off outside foot into a hop stop, squared up). See Shooting - Mike Procopio wing, Pitt sweep series, Bill Self Perimeter, 5star foul-line flash, Footwork - Jay Wright jab-swing series.